A Mothers Day project for kids doesn't have to be expensive or difficult in order to be special. 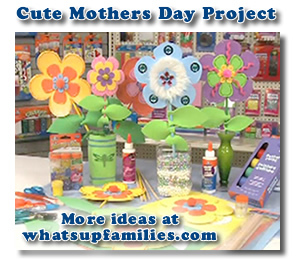 Let me share one of my favorite Mothers Day crafts for kids that will bring your family together. In my house crafts are an everyday experience and it's important to me that my son is able to use his imagination and his hands. There is no better way to spend the day together then to work side by side on a Mothers Day project that your children will take pride in. To me Mothers Day isn't just a day for the Mom but a day where she can be surrounded by her family and truly feel blessed. To keep to a budget I always start by collecting what we already have around our house and there is one particular project that needs no extra supplies, home made bouquets! The paper rolls will act as the stems of the flowers, so you start by deciding how high and short you want your flowers to be. Because the rolls are wide the flowers are not going to be actual size but bigger, which makes them more dramatic. You can cut the rolls if you want to various sizes. Often times I leave the toilet paper rolls the same size and then cut the paper towel rolls in half, but not exactly half so that there is variation in sizes. Take green construction paper and cut sections to match the length of the rolls. Glue around the edges of the paper and roll them around the rolls. Your "stems" are finished. Now it's time to make the flowers! Here is where you and your children can get really creative. You can make the flowers however you want. You can make giant sunflowers by cutting yellow petals out of the foam sheets, cut about 6, however small or large you want. Then using a brown foam sheet cut a big circle for the center of the sunflower. Be sure to make it big enough to support the petals. In the center of the circle cut a little hole. Glue the yellow petals to the circle but make sure not to cover the hole. To add a little sparkle, swirl a little glue on the circle and add just a touch of glitter. Take a pipe cleaner and place it through the hole in the circle and bend just a little bit so it's in place and then run the longer end of the pipe cleaner down the roll that you covered in construction paper. If there is a little extra pipe at the end bend it up into the roll so that it doesn't show. Take some of the green construction paper scraps that you have left over and cut fun little leaves and glue them all around the roll. 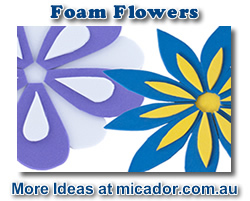 The foam is light enough so that the flowers should stand up on there own, but you can "arrange" them in a clean flower pot or even a decorated shoe box to finish off your centerpiece. You could use shredded paper as the filler "grass" and tuck the flowers in around it. From there the world is yours! You can also make a beautiful array of flowers from bright red roses to tulips. ***For those type of flowers it works best to use a little tissue paper. Just roll them, glue the ends, and fluff up the tops. The garden that you've created will make a lovely centerpiece for your special Mothers Day dinner. The most rewarding part of this Mothers Day project for kids is that they result is something that you're children can take pride in. When you're children are happy, that really is the best gift.